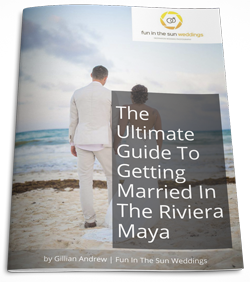 How To Pick The Best Cancun Wedding Packages For The Rainy Season? If you are a bride-to-be with this vision for your destination wedding in Riviera Maya, Mexico…well, you’re not alone. But what if you want, or need, to plan a destination wedding in Cancun during the fall? A little research will tell you that September, October, and even November can be pretty unpredictable and wet here in the Caribbean. Add to that, it’s hurricane season! Do you accept that planning a fall wedding in Cancun is too dicey? Cancun, Playa del Carmen and Tulum are a mecca for destination weddings and holiday-makers alike. Ask any local and they will tell you that high season seems to run almost the whole year ’round these days. Except in September and October. Most people in the Northern Hemisphere are coming off the high of summer, and so fall becomes a time to hunker down and get back to their regularly scheduled programming. This is where YOU reap the rewards! 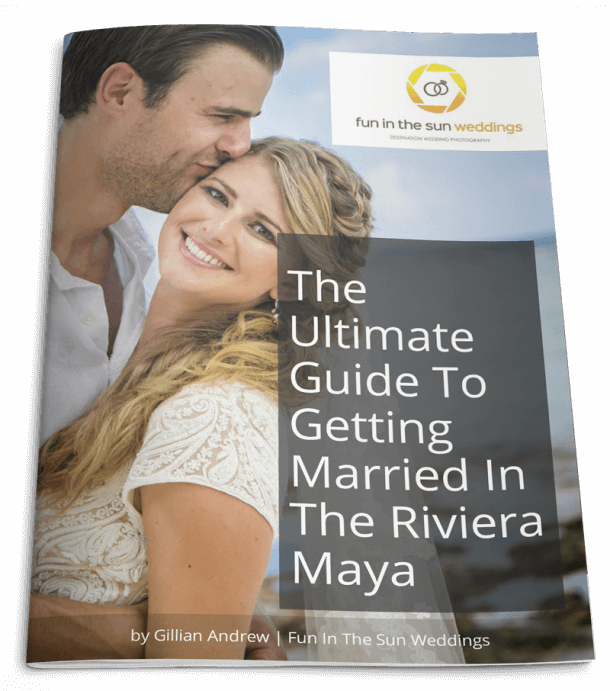 With fewer people vacationing in the Riviera Maya, this means fewer people getting married on the beach here too. You will find that the resorts are not as crowded. And why does this matter? You get your pick of what time of day you want your wedding ceremony, rather than getting stuck with some unbearable midday hour. There will be fewer Looky-Loos on the beach, watching you on your special day and getting into the background of your wedding photos. You have a far better chance of booking the honeymoon suite! If you want a destination wedding on the beach that is more private and intimate, then planning a fall wedding in Cancun is the ideal time to do it. *Newsflash* – Low tourist season equals lower prices! It’s simple Supply and Demand. Look for wedding package deals and extras offered by the resorts or off-resort wedding venues you are considering. Discounts are great, but so is a complimentary package upgrade, romantic dinner on the beach, or guaranteed booking into the honeymoon suite! Expect that wedding vendors will be more open to giving discounts to earn your business. With open gaps in most vendors’ low season calendars, now is the time to master those negotiation skills! Ask your Travel Agent to shop around for cheap low season flight packages for your wedding guests. Buying in bulk during the slow season puts you in the drivers’ seat with airlines…and this might lead to more of your loved ones being able to afford the trip! Hooray! Shop around and pay attention to who is offering incentives, and don’t be afraid to ask for a deal! This is Mexico, after all. Fall in the Caribbean is the tail end of the hurricane season. This is a time of year where we get lots of the rain that keep the tropics lush and gorgeous. Almost like clockwork on September 15th, the rain increases and the smoking hot temperatures of summer shift to welcome in a cooler, fresher fall. Thankfully, this means that you won’t have to suffer the heat exhaustion of being wrapped up in your beach wedding dress, and your wedding guests will be happier too. You may all love the Mexican heat, but dealing with it in anything more than a swimsuit can be a challenge. Coming off of a string of seriously HOOOOOOT months, Fall is just lovely. Maybe talk of the cleansing, cooling rain makes you nervous…because this could mean a total beach wedding washout for you? A little forethought and planning should help calm your nerves, here are some helpful tips to cope with a rainy beach wedding. Let me preface this by saying that the weather is unpredictable at ANY time of year down here in the tropics. Sure, September and October are typically the soggiest, but that doesn’t mean that it rains all day every day. Usually, it’s a good blast of the wet stuff for 10 minutes a day, and then it’s done. But let’s assume the worst case scenario: Hurricane-like weather on your wedding day. Yikes! No it’s not ideal, but as The Knot promises: You will survive! Professional Riviera Maya wedding photographers and planners know the deal with hurricane season. We all have some level of experience in dealing with stormy weather. Keep stress at bay by asking about the backup plan when you book your vendor. When you have a Plan B you can live with, you won’t need to worry about things you can’t control – like Mother Nature. Stick with local Riviera Maya wedding vendors who have experience with fall season weddings in Cancun to Tulum. Then keep calm and carry on. If you’ve been stressing about planning your fall season wedding in Cancun, don’t! It’s really not difficult as you think. Yes, the weather will be more unpredictable and possibly a bit soggier than at other times of the year, but balance that against the other great low season perks and trust that you will come out on top. What are you most worried about in planning your fall wedding in the Cancun area? Leave it in the comments below. And if you are hunting for the best wedding photographers in Cancun then get in touch with us today! We are Fun In the Sun Weddings, the best photographers in Riviera Maya: Playa del Carmen, Tulum and Cancun.